PITCAIRN ISLAND: home of Mutineers, Artists and Superhero Bees! 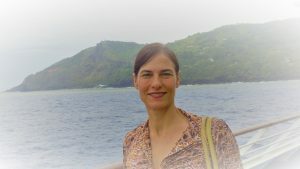 I am aboard a small cruise ship, circumnavigating Pitcairn Island. 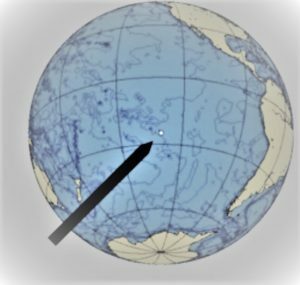 It is only two miles square—a tiny deep green bump smack dab in the middle of the South Pacific. The ocean is angry today, and sprays a breathtaking sapphire blue. The skies are bleak and ominous. 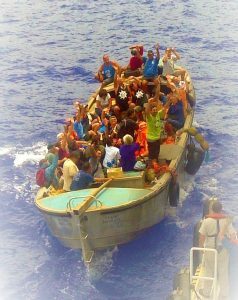 The island has no port to accommodate a ship of our size, and so the people of Pitcairn have been invited to come to us. I hang over the rail and search through the tropical rain until my sundress clings to me like a second skin. 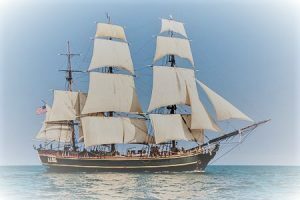 I want to catch a first glimpse of these most unusual residents; descendants of the mutineers from the famous ship Bounty, of Captain Bligh fame. Nearly all of the islanders, isolated completely for centuries, have the same two last names—Fletcher and Christian—whose same-named ancestors escaped the gallows of England by marooning themselves and their Polynesian wives on Pitcairn in 1790. Pitcairn island steams a halo of cloud and fog from the torrent. As we sail closer, I see sheer cliffs, and a cascading waterfall. Twenty-odd houses nestle against a steep hillside, each separated by forest and a steep hike. At last a long boat comes into view. There are only fifty-four inhabitants on the entire island, and thirty of them—more than half the population—sit precariously yet happily on planks, grateful to have a break from island fever. They bob along towards us in the pouring rain and choppy seas, with the steadfast balance of true islanders. When they finally pull alongside our ship, they leap to the treacherous lurching gangway like mountain goats, these people made of volcano and sea. The thing that catches my eye is a beautiful necklace. 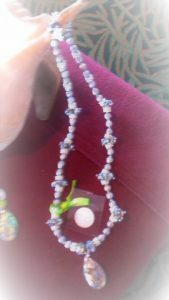 If I shut my eyes and imagine a mermaid swimming in the depths of the sea, this is the necklace she would be wearing. It is made of beautiful oblong silver pearls. Not flawless, but that is part of the beauty. In between the pearls are sea shells, black luminescent stones and clusters of tiny silver beads, with the New Zealand Paua shell as a pendant. Oooh! I have to walk away quickly to resist temptation. The biggest seller is the honey. 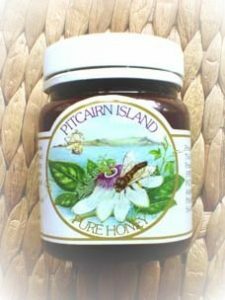 With the current world bee crisis of diseased bees, and the diminishing bee population, Pitcairn Island honey is very sought after. Completely isolated, the Pitcairn bees are free from disease. Pitcairn honey is said to be the finest, purest honey on earth. Who knows? If the bee crisis gets bad enough, perhaps Pitcairn will be our salvation—after all, we need bees to pollinate our crops. I like the idea of the smallest inhabited island Democracy saving the world. There is something very poetic and noble about that. I spy an amazing looking man from Pitcairn–starkly unique. He is a large man, with the build of a Pacific Islander—stout and muscular. 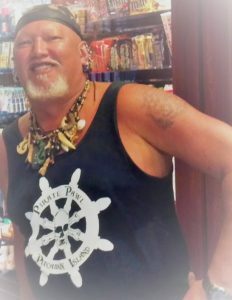 His coloring is Polynesian, his beard is blond, and attached to his ears, which are pierced from top to bottom, are a cacophony of magnificent trinkets, again what one would find a merman wearing, from bone to pearls to shells to sharks teeth. Around his neck is a chain, thickly laden with more booty. I imagine him living under the ocean, and swimming until his neck and ears encrust with barnacles of briny jewels from the treasure troves of the sea. He concurs with a broad smile, and I seize the opportunity to take his picture, shouting, “You are gorgeous!” which results in a priceless picture of him laughing. I suppose that must be true, but what fun that would be—I’d do it in a heartbeat! And next time, I’m buying that necklace. If you enjoyed this story, please subscribe to my blog! I love to hear from you, please leave a comment!